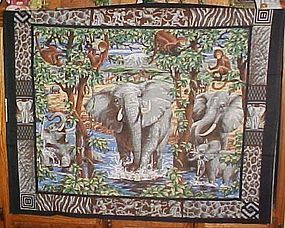 New but older stock Springs Industries printed fabric panel of African Elephants in the jungle. This 1 yd panel would be perfect for creating a unique craft as a large floor pillow, quilt center, wall hanging, or a throw, Just use your imagination and ready-get set-and sew! I have 3 of these panels available. Price is for each 1 yd panel.